This year's springtime edition of the Hawaii International Jazz Festival moves to the reputable Halekulani, "on the beach at Waikiki." The dance floor on the hotel's second-floor ballroom should be well-utilized, as the festival features guest artist Shelly Berg. The man is Mr. Versatility, a well-respected pianist, composer, arranger and educator in jazz circles. Based in Los Angeles, Berg is a professor and chairman of jazz studies at the Thornton School of Music at the University of Southern California, and is also a staple on the city's jazz scene. He's also had a long collaboration with trombone great Bill Watrous, and has accompanied singers and Hawaii favorites Monica Mancini and Tierney Sutton. Berg will be featured in a trio setting here, accompanied by bassist John Kolivas and drummer Adam Baron. 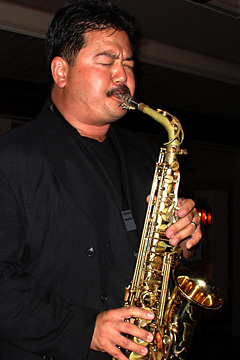 His set will be preceded by an all-star section, showcasing local talents such as vocalist Ginai and a large band that includes Kolivas and Baron, plus saxophonists Gabe Baltazar and David Choy, ukulele whiz Abe Lagrimas Jr., trumpeter DeShannon Higa, pianist Rich Crandall and guitarist Robert Shinoda. The evening will conclude with a jam session with all involved, plus guitarist Shawn Ishimoto and members of the Iolani School band. 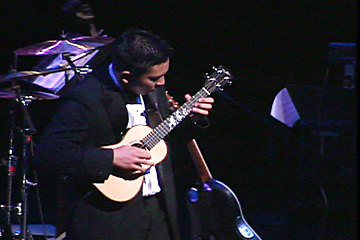 ...Abe Lagrimas Jr., above, and featured artist Shelly Berg perform at the Hawaii International Jazz Festival Saturday.